The Palo Alto Daily Post, bastion of journalistic integrity, has on several occasions reported as fact that the blended HSR system on the peninsula would require 100% grade separation in order to share tracks with Caltrain, resulting in dozens of seized residential properties. When sharing tracks with other trains, high-speed trains can and do use grade crossings on a daily basis, with all their attendant risks. Examples of this practice abound in Europe, where new HSR networks have been patched into existing rail networks. High-speed trains are limited to the same speeds as other trains when using grade crossings, and are exposed to the same collision risk. The trains are built to take it (the relevant standard is EN 15227) and have been involved in dozens if not hundreds of grade crossing accidents over the past three decades. 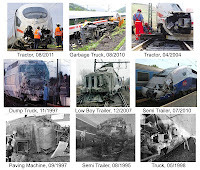 When a train collides with a car, damage to the train is usually only cosmetic. 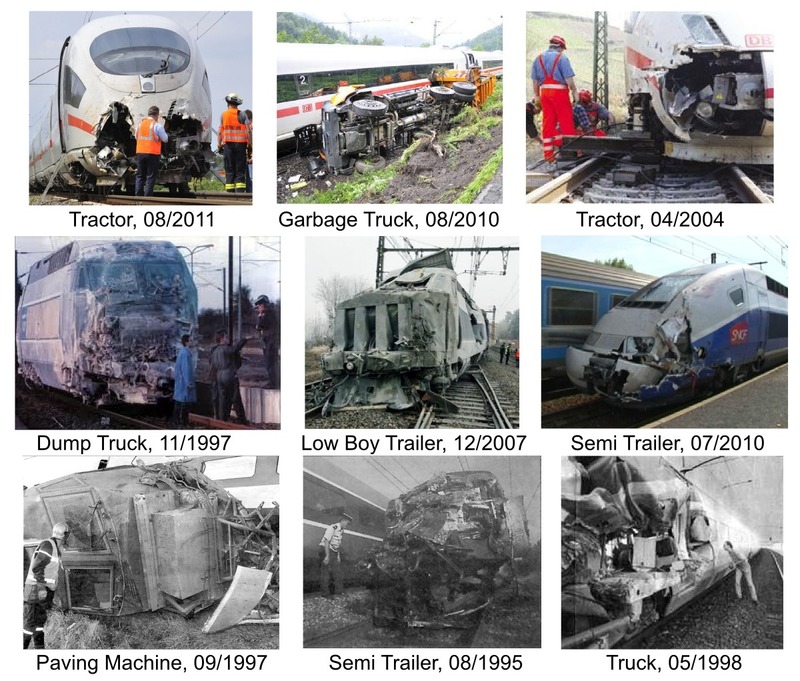 But high-speed trains have also collided with trucks and farm tractors, with more dire results, but only one known passenger fatality in 1988. A small sample of those horrors is provided at right. On a mostly grade-separated corridor like the peninsula, new grade separations are desirable primarily because they reduce gate down-time and speed the flow of road traffic, and secondarily because they reduce the risk of collision with pedestrians, cars and trucks. They are not inherently required to operate high-speed trains in a blended system, any more than they are required to operate Caltrain. Suggesting otherwise amounts to baseless fear-mongering that is best confined to the editorial page. In an historic vote, the legislature today approved a funding package worth about $8 billion to begin construction of the first high-speed rail system in the Americas. To make the package politically more palatable around the state, it included the immediate release of $706 million of so-called "book end" funding in the form of Proposition 1A bonds specifically allocated to the modernization of Caltrain, per the recent Memorandum of Understanding approved by all involved agencies. The $706M total includes $600M of high-speed rail funding and $106M of non-HSR connectivity funding, from pots of money that are subject to different constraints. These sums form the lion's share of a $1.456 billion funding package that covers both electrification and a new signal system for the peninsula rail corridor. Taxpayer Lawsuits. The opposition remains fervent and relentless, and a lawsuit challenging the release of $600M of HSR bonds to improve the Caltrain commuter rail system, with not a high-speed train in sight for more than a decade, is a near certainty. Protections are built into the law, and require several conditions to be met for release of the funds. Approval by the legislature is only one of those conditions, and the interpretation of the remaining ones is likely to become legally contentious. The Environmental Clearance Process. In April of 2010, Caltrain's electrification project had already obtained federal environmental clearance under the National Environmental Protection Act (NEPA) as the Caltrain board of directors came within a few dramatic minutes of certifying the Final EIR under California's Environmental Quality Act, or CEQA. The board stopped short, under a surprise threat of a CEQA lawsuit, preferring to resolve any issues outside of the legal system before certifying the FEIR. While the scope of the electrification project has not changed under the recently approved MOU, the project has now become the first in a series of incremental investments leading up to the "blended system" envisioned in the latest HSR business plan. That means the electrification EIR may go back to square one for yet another round of public circulation (following prior rounds in 2004 and 2009), a process that is likely to take several years. It would be surprising to see a new FEIR before 2014. CEQA Lawsuits. The sole enforcement mechanism built into CEQA is the lawsuit; it is therefore expected that lawsuits could follow the certification of any EIR. While clearing electrification as a stand-alone project might be legal under CEQA, the issue is complicated by the project's new association to high-speed rail. The two-tiered environmental clearance process adopted by the HSR project has already run into serious resistance, with the Bay Area to Central Valley Program EIR about to enter its third round of litigation since 2008. HSR opponents could easily argue that funding the electrification project under Proposition 1A requires the prior clearance of both this program EIR as well as the project-level EIR for the "blended" San Francisco - San Jose section of the HSR project, including all the project phases expected to be completed after electrification. Those later phases would include more controversial measures such as the construction of new overtake tracks and new grade separations. This document is yet to be drafted; while the peninsula project EIR for the full-bore four-track system (still allowed for in the program EIR) was almost ready to circulate as of late 2011, it will require extensive revisions before it conforms to the "blended" configuration. And that's before it becomes mired in what could become years of CEQA litigation. The Lead Agency Issue. The high-speed rail authority has in the past been openly hostile to funding Caltrain improvements. The new leadership, under board chair Dan Richard, may not be much different. Richard, like Kopp before him, is a longtime supporter of the expansion of BART, which has always been in invisible tension with Caltrain enhancements. While he has extolled the merits of the blended book-end approach to gain political support for the entire HSR endeavor, this stance could very well weaken now that the legislative hurdle is passed. Prior to the vote, he was quoted as saying "The Legislature wanted to emphasize that this money would be there for (the Bay Area and Southern California). And they’re right," highlighting that it is the legislature pushing this funding, not the CHSRA. Indeed, the Authority, and the transit industrial complex behind it, may be reluctant to push for the peninsula improvements (a) because the opposition there is intense, (b) because of inter-agency rivalry with Caltrain, and (c) because the proposed projects do not involve large-scale civil works of the sort that Parsons Brinckerhoff likes to design, and its acolytes in the construction industry like to build. Progress on the electrification project could thus depend on which agency leads the EIR process and pushes the project to fruition. Caltrain is both competent and motivated, but the CHSRA could easily drag its feet--after all, the legislature has only authorized the bond funds to be spent, but the CHSRA retains full authority over when to actually spend them. All the MOU demands of them is "good faith," which has been in demonstrably short supply. CBOSS. While the spotlight is on the electrification project, the MOU and newly passed HSR funding also covers Caltrain's new Advanced Signal System, also known as the Communications Based Overlay Signal System or CBOSS, and often criticized on this blog. This project is a necessary pre-condition for the operation of light-weight European-style trains, and must be completed by the end of 2015 under a federal mandate that shows signs of being delayed to 2018 or 2020. Despite Caltrain's repeated insistence to the contrary, CBOSS will not be compatible with HSR other than by fitting two separate, expensive, and functionally redundant signaling systems on high-speed trains, an unavoidable and inconvenient truth that may call into question the wisdom of spending even one cent of HSR money on CBOSS. A far better outcome would be to make the peninsula rail corridor a testbed for the actual train control system to be deployed on the HSR system, based on the increasingly mature worldwide ERTMS rail signaling standard. The Timeline. The money is available only until June 30th, 2018. UPDATE: The Poison Pill. At any time before then, a single stroke of the pen from the Department of Finance can transfer the money to the Central Valley projects, per the Budget Act of 2012, Section 2.00, Item 2660-104-6043, Section 3, Provision 2. The legislature's momentous step leaves many questions unanswered. Is the funding of Caltrain improvements using high-speed rail bonds legal? Will opponents hog-tie the electrification EIR to the high-speed rail EIRs in a bid to delay? Can the existing electrification EIR be tweaked, or is it back to square one? How eagerly will the CHSRA push electrification forward, if the focus is initially in the Central Valley? Is it legal to spend HSR money on CBOSS? Will the project be shovel-ready by June 30th, 2018? How will questions of leadership be resolved, among Caltrain, the CHSRA, Parsons Brinckerhoff, and the regional design consultants? Will the agencies finally treat technical compatibility between Caltrain and HSR, as long advocated in these pages, as the priority that it ought to be, allowing any train to use any track to serve any platform? Only one thing is sure, there is a lot more sausage-making still ahead of us.